It doesn’t matter if you are a regular at the gym, enjoy playing sports, or have a physically demanding job. Injuries can and do happen to anyone. And when you suffer an injury, pain isn’t generally far behind. Picking up a light knock during a game of football, for instance, can cause discomfort and feelings of mild pain. 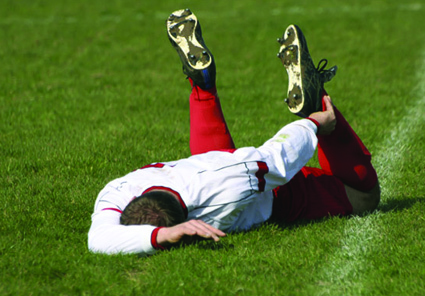 A sprain, strain or even a break can be significantly more severe. Injuries sustained from slipping or tripping at work can be just as incapacitating. They may require a lengthy recuperation time, or even surgery. When recovering from an injury, maintaining a positive attitude is essential. Staying optimistic can help you overcome your condition more rapidly and potentially get you back on your feet sooner. But staying hopeful can be hard when you suffer from severe pain. Fortunately, pain relief is available to buy online for those laid up at home nursing a sports- or work-related injury. Depending on the severity of the injury, a number of pain medications are available to help to reduce swelling and inflammation and alleviate discomfort. If pain is mild to moderate, then a doctor may issue Co-Codamol. This works by inhibiting the sensitivity of nerves in the injured area and dulling the brain’s perception of pain signals. For more severe cases of pain that may have resulted from serious injuries or invasive surgery, a doctor may prescribe Zydol or Zamadol, which are strong-working opioids. These products are not suitable for everyone and may cause side effects. It is extremely important to ensure they are safe for someone to use prior to their purchase and administration. When buying painkillers in the UK, it is vital to do so from a safe and legal source you can trust. For all prescription treatments, prior consultation is required before a prescription can be issued and a purchase made. This is so a doctor can assess your suitability for a specific medication, in case you have a condition that puts you at risk of suffering from harmful side effects. Delivery of all of our items is free and made by next day tracked courier. Orders completed on weekdays before 3 p.m. will be shipped on the same day. For your safety and privacy, we ensure your order is delivered in secure, unmarked packaging. If you want to purchase pain medication online, the process has never been easier or more secure. When you place an order with us, you will be guided through our easy-to-use consultation process, and a GMC-registered doctor will review your condition. If approved, your prescription will be issued and sent directly to our dispensing pharmacy.